SERIES OF BURGLARIES. FIVE CHARGES ADMITTED. PLEAS FOR PROBATION, HIS HONOR DEFERS SENTENCE. Strong pleas for probation were made by counsel appearing for Colin William Glass and Ronald Leslie Rush, who came before Mr. Justice Smith at the Supreme Court this morning on five charges of burglary and theft and one of attempted breaking and entering. Mr. V. B. Meredith, said that about £50 worth of property had been stolen, the bulk of which had not been recovered. The depredations of Glass appeared to be developing for the worse. Bush had previously a clean sheet in controlling him. His Honor said that in view of what had been said he would give the cases further consideration and remanded the prisoners till to-morrow morning. In the meantime his Honor would consult with the probation officer. Auckland Star, 8th July 1930. YOUTHS SENTENCED. SERIES OF BURGLARIES. Two youths, Colin William Glass (17) and Ronald Leslie Rush (19), on whose behalf strong pleas were made for probation yesterday, were sentenced by Mr. Justice Smith in the Supreme Court to-day. They had admitted five offences of burglary and theft and one of attempted breaking and entering. Following the pleas of counsel yesterday, his Honor obtained a report from the probation officer. He said he had come to the conclusion that the governing factor was the nature of the offences committed. His Honor traced the career of crime from June 8 to June 22, when it was brought to an end. "It appears impracticable, in these circumstances, that I should grant probation," he said. "The public interest requires that some punishment should be inflicted upon you." Glass, though two years younger than Rush, was described by his Honor as the chief offender. In his case a period of discipline was clearly necessary. The only course was to order him to be detained in the Borstal Institute for three years. Rush had a better record, said his Honor, and there was nothing previously against him. It appeared likely that he would make good with a much shorter term than Glass. As the minimum term for the Borstal Institute was two Tears, his Honor eaid he would overcome the difficulty by ordering one year's reformative detention, with, the recommendation that it be served in the Borstal Institute. "I trust those interested in you before will still be interested in you, and you will yet make good," concluded Ms Honor. Auckland Star, 4th May 1938. The success that so far attended the efforts of Colin William Glass to evade capture following on his escape from the Waikeria Institute, in the Te Awametu area, on Monday, April 18, has inclined the police to the theory that the escapee has had outside assistance. It may be, it is considered, that his escape was not undertaken impulsively, but as a move in a careful plan The general public, however, uneasy at the thought of such a man being at large,is now wondering why a man who was arrested in the first instance in dramatic circumstances and who has now made his second bid for liberty should be confined in an institution such as Waikeria. Glass received five-year term of imprisonment after his arrest in sensational cirmstances by Detective S. Whitehead on July 30, 1934. That evening, Mr. J. Jurie. a well-known boxer accompanied by Mr. Facoory, a boxing trainer returned to his shop, the Oceanic Fish Company, in Queen Street near the corner of Wakefield Street They_went into the back yard to hang out Mr. Jurie's boxing clothes and Mr Jacoory noticed some person crouching on the roof. 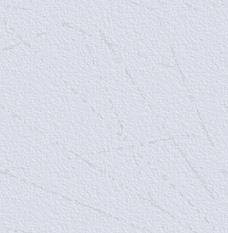 In reply to a sharp enquiry from Mr. Jurie, the man said: "Sh! Don't make a noise. Im watching a joker here." "What is your name?" asked Mr. Jurie. "It's an right. I'm Detective Hunt," the man replied. Puzzled, Mr. Jurie telephoned "the police station and found that Detective Hunt was on duty. Detectives S Whitehead and W. Slater immediately left for the shop and on their arrival Detective Whitehead and Mr. Jurie climbed to the roof. They could not find the man, but walked along the rooftop towards the St. James Theatre, where he was discovered crouching in the shadows. "Can't a man have a look around?" be said in reply to the detective's question. Detective Whitehead began to search him and from the first pocket examined he removed gelignite, fuses, detonator caps, a mask and putty. "Where did you get these?" asked Detective Whitehead. I'll show you!" said Glass, producing a revolver. "Stick them up!" Mr. Jurie leaped at Glass and threw him with a wristlock, snatching the revolver. He then struck a heavy blow that knocked the intruder unconcious. When the revolver was examinned it proved to be loaded. Glass was sentenced to five years imprisonment on the various charges preferred against him, his Honor Mr Justice Herdman stated not been the trigger misfired there would have been a much more serious charge, and referring to the fact that Glass had in his possesion a deperado's complete outfit. He was arrested eight days later near the Puriri Bush, five miles from Pukekohe, by Constable Mawhinney, and was sentenced to a further six months' imprisonment, to be served at the conclusion of his five-year sentence. It was stated later that telephone calls had been received by Mr. Jurie, threatening his life, and it was thought that Glass was responsible. Glass made his second eecape by momentarily eluding the warders at the Waikeria Institute about 7.30 o'clock on the evening of April 18. He dashed into the darkness of the grounds with members of the staff in pursuit, but succeeded in getting clear. Though, a wide alarm was sent out, and organised searches were conducted, no trace of the escapee was found. Waikeria is the centre of a well settled, farming district, but there are numerous patches of heavy scrub that would afford the 26-year-old, fugitive temporary shelter. Though the police are on the look out for him all over the North Island he has not been reported from any locality, which leads to the belief that he is being helped. 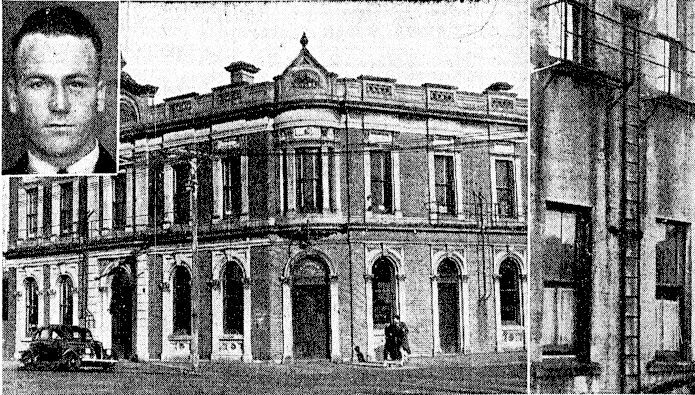 The Rob Roy Hotel at Freemans Bay, where Colin william Glass(inset), an escaped prisoner, was rearrested on Saterday night after he had scaled a fire escape (shown right) , and taken refuge in the Wardrobe of a locked Bedroom. Auckland Star, 7th July 1938. INCREASE OF ONE YEAR. - GLASS IS NOT A ROGUE." For his second escape from custody since he was sentenced to a term of five years in August. 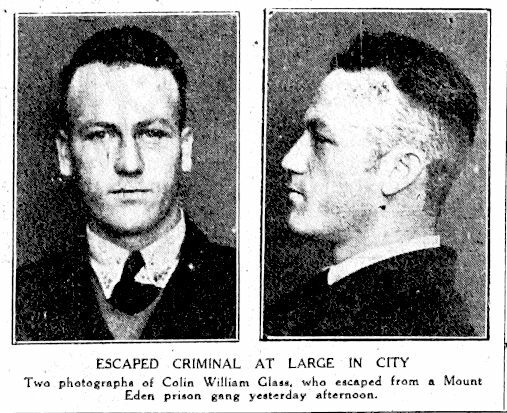 1934, Colin William Glass 25, recaptured in a room of the Rob Roy Hotel, Freeman's Bay, on June 2, almost two months after he made a dash from the Waikeria Borstal Institution. received his penilty from Mr. C. R. Orr Walker, S.M., in the Police Court to-day. Glass was charged with being found without lawful excuse in the Rob Roy Hotel on June 2nd; escaping from lawful custody, having been convicted of the offence of attempting to discharge a firearm with intent to do grievous bodilv harm to Detective S. S. Whitehead; and thirdly with being an incorrigible rougue in that he escaped from lawful custody. Glass. for whom Mr. Lennanl appeared, pleaded guilty to the last charge, whereupon Sub-Inspector M. Flanagan offered no evidence in connection with the first two charges. These were withdrawn. Sub-Inspector Flanagan said Glass after being confined in the Auckland Prison was transferred to the Waikeria Borstal, from where he escaped on April 18 last. He was recaptured in a room in the Rob Roy Hotel on the night of June 2 when Glass was found hiding in a wardrobe. 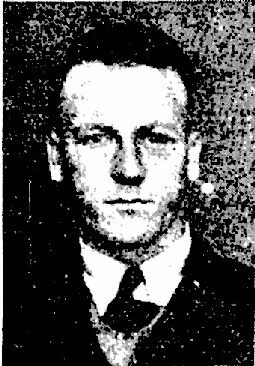 Glass was sentenced inthe Auckland Supreme Court on August 27, 1934, to four years* imprisonment for breaking and entering and five years for attempting to discharge a firearm with intent to do grievous bodily harm. The sentences were to be served concurrently. In December of 1934 Glass escaped from custody as the result of which he was given an extra six months' term. He had been previously charged with being an incorrigible rogue. Mr. Lennard doubted the wisdom of sending Glass to Waikeria. Glass might have been released on license at the end of the present year if he had not escaped. "His escape was not premeditated," added counsel. "He was left unguarded and he succumbed to temptation. He was at liberty a long time, and it is in his favour that during that period he did not commit a single offence. He has now forfeited all good conduct remissions, and no doubt will have to serve the whole of the five years and a half. I would ask your Worship not to add a substantial cumulative sentence." "So far as Glass is concerned no one wants to be hard on him," said the magistrate. "He followed the usual impulse, I suppose. The sort of liberty that he recently enjoyed is not much good, when he could not venture out much in the day time for fear of being recognised by a police officer. It's a wonder he did not think of that before he broke out. A sentence not given to have revenge on any particular man, but it is imposed as a deterrent to others. The Prisons' Board is most generous to prisoners, and notwithstanding Glass' conduct they I am B,, reconsider his when the time comes. Glass was sentenced to 12 months 'imprisonment. "Is that concurrent?" asked the prisoner. "No, cumulative," replied Mr. Orr Walker. "I don't think that he is a rogue, and I hope he is not incorrigible," the magistrate added. "Time will tell that. New Zealand Herald, 1st December 1939. LABOURERS' OFFENCES; ONE MAN SENT TO GAOL, COMMENT BY MAGISTRATE! Charges of being found by night on November 17 without lawful excuse on enclosed premises at 5 Huntly Avenue and frequenting Khyber Pass Road and Huntly Avenue with felonious intent were preferred against two labourers, Colin William Glass, aged 26. and James Billing, aged 42, in the Police Court yesterday morning. Mr. J. Morling, S.M., was on the Bench, and Mr. Robinson represented both accused. Pleas of not guilty were entered. Mrs. K. Reilly gave evidence that she had been accosted in Khyber Pass Road by Billings, who had pretended to be a detective. Later she had seen both accused in Huntly Avenue and had telephoned the police, as they were loitering near a neighbouring house. She had asked three other women she met in the street to walk home with her because she was afraid Billings would accost her again. Constables Gaines and Pender gave evidence that they had found Glass standing outside 5 Huntly Avenue while Billings was lying on the grass near the fence inside the grounds. When spoken to, Glass gave his name as Bert Williams and said he was waiting for a friend. Both were taken taken to the detective office. In evidence, the accused said they had mistaken the house for that of a friend by whom they had been invited. "I have no doubt as to the guilt of the man Billings." said the magistrate. "It is a very serious offence to accost a woman. " Billings was convicted and sentenced to three months imprisonment on each charge, the terms to be concurrent. ,br> "The probation officer has put forward a verv strong plea for mercy on your behalf," the magistrate said to Glass, "and I shall give you a chance." Sentence was deferred for six months. A clerk. Ernest Edwin Newton, 31 (Mr. Moody), and a labourer, Colin William Glass, 30 (Mr. Sullivan) stood trial yesterday before Mr. Justice Callan and a jury on a charge that on August 12 they broke and entered Market Service Station, Sturdee Street, with intent to commit a crime. An alternative count charge was of attempting to break and enter the service station with intent to commit a crime. Outlining the Crown's case, Mr. G. S. R. Meredith said evidence would be given that about 9.50 p.m. on August 12 a constable on patrol saw two men leave the door of the service station. He flashed a torch on them, and then, observing the door to be open, he gave chase and caught one of the men who was Newton. The other man escaped. Across the street from the service station a car was found which was registered in the name of Colin William Gillard, and bore a number plate issued for the year 1937-8, while the correct number plate for the current year was under a front seat. This car was taken to the police station, and next day Glass claimed the car. He said it had been taken from his garage, that he had been home all night, and did not miss the car till that morning. The constable identified Glass as one of the men he flashed his torch on near the station the previous night. Identification Questioned Constable R. T. Keane, who gave evidence of the pursuit of the two men, the capture of Newton and later the recognition of Glass, was closely cross-examined on his identification of Glass at the identification parade. He said no photograph was shown him either before or after the parade. After evidence had been given for the Crown on the lines indicated, the two accused went into the witness box and denied committing the offence. Newton, who was said to have been seen by a constable to have come from the doorway of the station in company with another man, and was caught by the constable after a chase, said he ran away because he went into a panic when he saw the constable and another man run, and heard the constable's whistle. This was because he had been in trouble before, and did not wish to be caught in the vicinity of other trouble. He said he knew Glass, but Glass was not with him at this time. Glass, whose motor car was found parked across the road from the service station at the time said he was at home all that evening, and found next morning that the car had been taken from his garage. ,br> After a retirement of four hours the jury brought in a verdict of guilty against Newton but said it could not agree on the guilt of Glass. The case in which Colin William Glass, showcard writer, 31 (Mr. Sullivan), was charged before Mr. Justice Fair and a jury with breaking and entering a garage and with being an incorrigible rogue, in that he was found in possession of a housebreaking implement, was concluded yesterday in the Supreme Court. Accused was found not guilty on both charges. Accused, identified by a constable as the man found near the garage at 1.30 a.m. on July 14, gave evidence that the constable was mistaken. He said he had been in bed all that night, and his wife corroborated this evidence. The manager of a hardware store said the implement in accused's car, a pair of footprints tongs (or gaspipe wrench) was a tool of common type and widely used in different trades. The jury returned after 31 hours with an acquittal, and accused was discharged. Note; There is no record of Colin william Glass having married! HAMILTON, Thursday Three charges of unlawfully converting motor-cars valued at £IOOO to his own use and four charges of the theft of petrol and goods to the value of £95 were preferred against Colin William Glass, aged 33, labourer, before justices at Hamilton today. It was alleged that the offences took place at Raetihi and Te Kuiti. Accused pleaded not guilty and was committed to the Supreme Court for trial. Bail was allowed. Convicted at Hamilton for theft and unlawful conversion of three motor cars, Colin William Glass (Mr. Trimmer) came before Mr. Justice Pair in the Supreme Court yesterday when a motion for leave to apply for a new trial on the ground that the evidence connecting him with cars was insufficient waa argued by Mr: Trimmer: Mr. H. T. Gillies, Crown solicitor of Hamilton, opposed the application, which was dismissed. His Honor then sentenced Glass to three years' imprisonment.